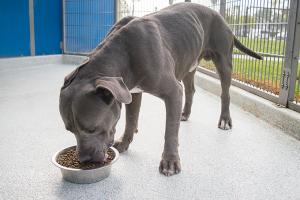 The pet food reserves are dangerously low at Society for the Prevention of Cruelty to Animals Los Angeles (spcaLA). spcaLA is appealing to the community for pet food donations or the funds with which to purchase food. Donations can be dropped off at any spcaLA location, shipped direct from spcaLA’s Amazon Wish List, or made at www.spcaLA.com. Dogs like Ezra need your help. spcaLA needs wet and dry pet food for dogs, cats, kittens, puppies, and rabbits. spcaLA uses an average of 60,000 pounds of pet food a year. That feeds about 500 animals a day at spcaLA’s three pet adoption locations, plus the animals at Long Beach Animal Care Services. Unopened pet food donations can be dropped off at any spcaLA location during business hours: 7700 E. Spring St., Long Beach 90815 (562) 216-2542; 12910 Yukon Ave., Hawthorne 90250 (310) 676-1149; 5026 W. Jefferson Blvd., Los Angeles 90016 (323) 730-5300 during business hours or ship directly from spcaLA’s Amazon’s Wish List available at www.spcaLA.com. For anyone interested in starting a pet-food-drive at their school, club, office, or place of worship, please contact spcaLA at info@spcaLA.com or call (323) 730-5300, x3253.